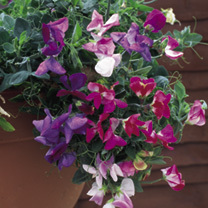 A naturally dwarf, cascading/trailing type - sweet peas can grow down as well as up! Appreciate the delicious perfume at nose level! 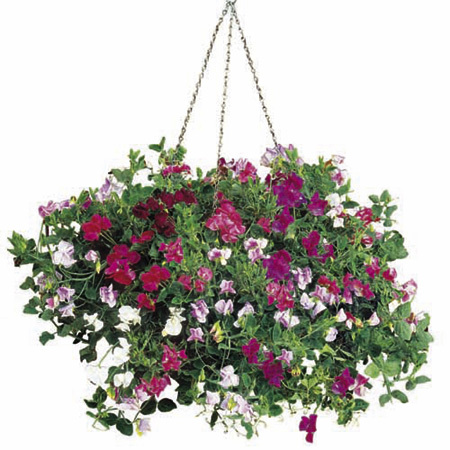 A worthy constituent for a hanging basket or tub display or alternatively t4ry for ground cover use. Good mix of flower colours. Height 23-30cm (9-12"). Easy to grow. HHA/HA - Half hardy annual/Hardy annual. Scent Key - 1 (delicious scent). Ideal for patio pots and containers, hanging baskets and as ground cover. Scented. Attractive to bees. Prefers full sun. Some varieties have hard black seeds and we advise soaking in water for eight hours before sowing. Excellent for hanging baskets. Try growing gypsophila to complement your cut sweet peas. Pick sweet peas continuously so that you ensure a summer-long display.